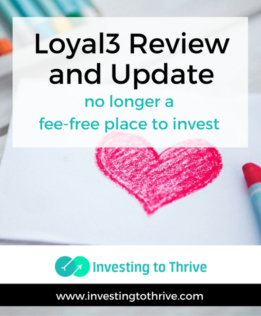 Update: The Loyal3 platform is closing and fee-free investing through Loyal3 is ending. According to an email update from Loyal3, investments will be transferred to a new platform with FolioFirst starting on May 22, 2017. Commission-free trading will continue; however, there is a $5 monthly fee for this privilege. In the past, I could buy shares of stocks issued by companies I know and love (the ones I'm loyal to — get it?) through Loyal3 for as low as $10 without paying fees of any kind. That's right, I didn't have to pay transaction fees or account maintenance fees or any other hidden fees that I forgot to ask about. The catch to this great set-up is simple: trades are batch processed rather than traded when I make a request to buy or sell the stock. So, I can't specify a limit price, which can be annoying — though I realize that this set-up may be a non-issue to other long-term investors. New investors who have little money to invest may find Loyal3 attractive. With a $10 minimum and no fees, With no trading fees and a minimum of $25, it's easy to get started in investing. Sure, there are limited choices. But, from a business perspective, there are solid selections among well-run, well-known companies. Whether the share prices will rise (an my net worth grow as a result) is uncertain but there's a possibility I'll own companies with solid foundations. More experienced investors may like Loyal3 as the brokerage firm offers a relatively inexpensive way to diversify a portfolio. For example, the roster of stocks represents many growth-oriented companies along with more stable, dividend-paying ones. Those who want to participate in IPOs (initial public offerings) can buy shares at Loyal3. In the past, buying into IPOs has been difficult for the small investor but Loyal3 changes this dynamic. Generally, there is a $100 minimum and $10,000 maximum purchase for IPOs. There were some downsides to investing with Loyal3. Those who wanted to invest for retirement didn't find IRAs available but FolioFirst plans to offer IRAs on its platform. Further, larger investors who wanted to buy more than $2,500 worth of shares in a certain stock within one month must go elsewhere as there is a cap on purchasing activity (this number may vary, so be sure to look at each stock's prospectus). New limits are $2,000 monthly. Nevertheless, Loyal3 FolioFirst could be a good choice for new investors who want to get started in the stock market and accumulate shares monthly, more experienced investors who also want to accumulate shares monthly, or those who want to add certain stocks to their portfolio — and find the $5 per month or $60 annual fee a less expensive choice than a traditional trading commission of $4.95 to $6.95. Getting started with Loyal3 was easy. The website design encouraged investors to choose the exact stock to buy first. Using this approach, you could enter the Loyal3 site by clicking on the name of the company desired. Get more information. Next, specify the amount to invest through a one-time or monthly purchase. Then you followed the prompts to complete the purchase, which included entering bank account information to initiate a funds transfer to pay for the specific stock. I could also fund an investment account with Loyal3 by transferring money from my bank account without making a commitment to buy a certain stock. This process was similar to that of a more traditional brokerage firm, where I opened and funded an account first and then chose an investment and placed an order for shares of a stock. Funding an account ahead of time allowed me to make purchases more quickly, instead of having to wait 3-4 days for the cash transfer to be completed. In the past, investors could use a debit or credit card to make stock purchases. This practice has been discontinued. Most of the stocks offered by Loyal3 had a large fan base and/or represented well-known household brands. Typically, the listing focuses on consumer-oriented growth companies, rather than industrial giants. However, there were stocks for nearly every investment taste including Alibaba, Berkshire Hathaway, Facebook, Google, Nike, Kraft, Target, Time Warner, and Twitter. The email indicates that over 200 stocks will be available for commission-free trading with FolioFirst. There are a few ways to choose a stock to buy: 1) choose purely what I love; for example, a gamer may want to buy Electronic Arts or a Richard Branson fan may decide to purchase shares of Virgin America; 2) select stocks based on in-depth analysis only, determining current valuation and buying shares only when the per-share price is below its worth and/or is expected to increase substantially; and 3) make a buy decision that combines what I love with a thorough analysis of its market worth. Note that some companies paid fees associated with their inclusion in Loyal3's platform; these are noted with a double-heart logo next to the stock's listing. This arrangement is similar to that of investment banking and brokerage firms that make markets for new (or existing) stocks. I had a fondness toward Loyal3 because the brokerage firm's design reminds me of a traditional dividend reinvestment plan (DRIP), which enabled me to get my start in investing. I heard about the DRIP of Duke Energy (NYSE:DUK) through an insert in my utility bill, filled out some forms to open an account, and periodically sent checks of $25 and $50 to the plan administrator, which invested my money on a quarterly basis. There were no fees for this service, except for a very small charge for selling shares. Today, DRIPs may have higher initial investment minimums, higher additional investment minimums, higher fees for processing share purchases, higher fees for account maintenance, etc. So, from my perspective, Loyal3 replaced those seemingly outdated plans with a modern, technology-driven one that is accessible to the new investor plus attractive for someone who is interested in adding a growth component to her portfolio. The pooling and consolidation of stock purchases and non-real-time purchase of shares by DRIP administrators was very similar to that of Loyal3. Also, there may be dollar limits on monthly investments with DRIPs and Loyal3, reinforcing the concept that this investing method may be attractive to an investor who wants to accumulate shares over time. In the past — to build a broad investment portfolio that includes money tucked away into tax-advantaged accounts such as Traditional IRAs, Roth IRAs, etc., you needed to open an account with a regular brokerage firm like E*Trade, Fidelity, Schwab, or TD Ameritrade. Now you can open IRAs with FolioFirst and still get commission-fee trading. However, there's a $60 annual fee, which may make more traditional firms seem more attractive. Loyal3 provided new investors and investors of moderate means with a great opportunity to accumulate shares of companies they loved at no cost. Such a firm was valuable to the investment marketplace because it allowed people to get started in investing easily plus build wealth over time. I'm sad to see the Loyal3 platform disappear and hope the new one continues to help new investors.